You can buy on-line using a credit card by clicking the button below each product description. Please note we use a third-party payment organisation, Netbanx, to whose site you will be taken. Alternatively either call us on +44 (0)1242 609239 and have your credit card details ready or download an order form for the product you require. We accept any card bearing the Visa, Mastercard or Eurocard symbols. All our pricing is in UK pounds. If you are purchasing from outside the UK you will be charged in your local currency at the prevailing exchange rate. You can buy RANT XL for just £80.00 (UKP) or the equivalent in your currency (currently approx $100), inclusive of postage and packing, by going to our on-line credit card order facility. As well as mailing a full copy of the program to you, we will send details of how you can download the program, usually within 24 hours of your order. Alternatively just call us on the number above and have your credit card details ready. If you would rather order by mail then click below to access our full order form. If you already own an activated copy of RANT XL Release 3, you need only pay our upgrade charge of £30.00 (UKP) to receive a full RANT XL Release 4 CD. 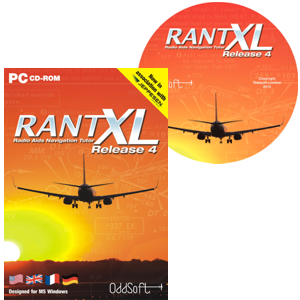 You will receive a full copy of RANT XL Release 4 with Jeppesen charting. You can order on line by going to our on-line credit card order facility. (You'll need the full serial number of your present copy of RANT - inside the CD case). As well as mailing a full copy of the program to you, we will send details of how you can download the program, usually within 24 hours of your order. Alternatively just call us on the number above and have your RANT XL Serial Number and credit card details ready. RANT XL is sold with a non-transferrable, single-user, single computer licence for private, personal use. If you are a training organisation wishing to join the many other schools using RANT as part of their training programme then you need a multi-user licence. Contact Oddsoft to discuss your needs and to request licence prices.